Alik'r Warriors are Redguard mercenaries from Hammerfell. They are on the lookout for a suspected traitor from Hammerfell, although it is unclear why. 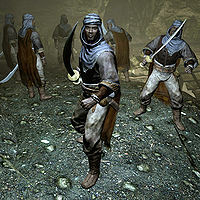 According to their leader, Kematu, they were hired by the noble houses in Taneth to track down a Redguard woman who supposedly sold out the city to the Aldmeri Dominion, causing the fall of Taneth to the invading Aldmeri Dominion armies. 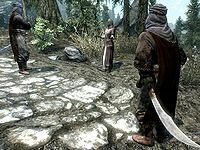 According to the accused woman herself, she publicly spoke out against the Aldmeri Dominion, who then hired the Alik'r to track her down. It is never fully explained, and it is up to you to pass judgment and choose who to help during the related quest. These two Alik'r Warriors are both Redguard scouts and show up in Whiterun during Dragon Rising. They both wear Hammerfell garb with a pair of Redguard boots and wield the rare, curved scimitar sword. One of them also wears an Alik'r hood. Guard: "Look, you've already been told you're not allowed here. Turn around and go back the way you came." Alik'r: "We're causing no trouble. All we ask is to look for her." Guard: "I don't care what you're doing, after what happened you're lucky I don't toss you in jail. Now get lost." Alik'r: "We will be back. This is not over." "Do you have news of our quarry?" After the conversation, the unhooded Alik'r will actively seek you out and say: "You there. We are looking for someone in Whiterun, and will pay good money for information." From this point forward, both of them will have the same dialogue options; when asked who they are looking for, they will start the related quest with the response: "A woman -- a foreigner in these lands. Redguard, like us. She is likely not using her true name. We will pay for any information regarding her location. We are not welcome here in Whiterun, so we will be in Rorikstead if you learn anything." When asked for reasons, the answer will be: "It's none of your concern. All you need to know is that we're paying for information. If that doesn't interest you, feel free to walk away." Lastly, they will repeat: "We're looking for a fugitive who comes from Hammerfell. A Redguard woman. She may be somewhere in this city." The final words will be: "If you locate her, find us in Rorikstead." Both warriors will then obey the guards' orders and leave Whiterun, walking all the way to Rorikstead. Once there, they will check in at Frostfruit Inn and await news from you. If you enter the inn, they will anxiously keep asking: "Do you have news of our quarry?" Once you have located the suspected Redguard, provided you didn't make an agreement with Kematu, returning to the Frostfruit Inn will give you a new dialogue option, namely to tell them you have seen her: "You have? Where? Tell me now!" If you ask what is in it for you, they will promise: "Money, if that is what you wish. Now tell me where she is!" When you tell them, you will be asked for one last favor: "We cannot go after her, not without drawing attention. You must bring her to us. Lead her to the Whiterun stables, outside of the city. We will wait for you there." As soon as you leave the inn, both warriors will be disabled and disappear from the game. "Listen, wench, we're on to you." 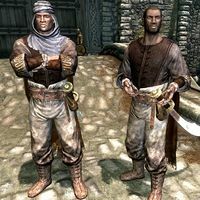 These two Alik'r Warriors can be found wandering the roads of Skyrim, in search of the suspected female Redguard. They will both show up in the wilderness under the same circumstances as their two Whiterun companions. They both wear the same outfit: Hammerfell garb with a pair of Redguard boots and an Alik'r hood. In combat, they rely on their scimitar. Alik'r #1: "Listen, wench, we're on to you. We know who you are, so you'd better come with us right now!" Woman: "I don't know who you think I am, and I don't care. Leave me alone!" Alik'r #1: "I don't have time for this foolishness. Now come along quietly and we won't have to get rough." Alik'r #2: "Brother, I think she's telling the truth..."
Woman: "I'm not going anywhere. Now back off before I do something drastic." Alik'r #2: "She doesn't have the scar." Alik'r #1: "What? Oh... you're right." Alik'r #2: "We've made a mistake. Now move along before that mouth of yours gets you into trouble." Woman: "Next time you're looking to pester someone, make sure it's the right person!" After the conversation, you can ask them who they are looking for and get the response: "We're looking for information about a woman -- a foreigner in these lands. She's a Redguard, like us. We believe she may be hiding in Whiterun, but we're checking everywhere to be sure." Six Alik'r Warriors can be found inside Swindler's Den during the quest In My Time Of Need, all of them protecting their leader, Kematu. They all wear the standard Hammerfell garb with Redguard boots and an Alik'r hood. In combat, they rely on their scimitar. When you reach the room where they hide, three of them will relax in the northern side of the room, while the other three will have their scimitars drawn, prepared to fight. Depending on your conversation with Kematu, the six warriors will either leave you alone or attack. If you leave peacefully, they will be disabled from the game once you finish the quest. 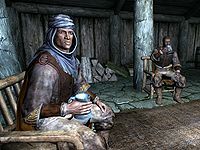 During the quest, you will learn about another member of the Alik'r, namely the Alik'r Prisoner who was caught sneaking into Whiterun and now serves his time in the dungeon of Dragonsreach. 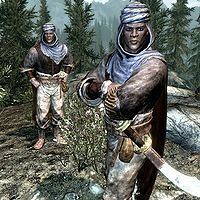 Whiterun Guards will occasionally mention them by saying "Have you seen those warriors from Hammerfell? They've got curved swords. Curved. Swords." and "As if Skyrim didn't have enough outsiders. Now we've got mercenaries from Hammerfell struttin' about..."
The first two Alik'r warriors will appear back in Whiterun after the related quest is over, remaining there permanently. The World Interaction for the second two Alik'r harassing a woman should stop appearing once the quest completes, but does not. This page was last modified on 3 June 2017, at 16:23.